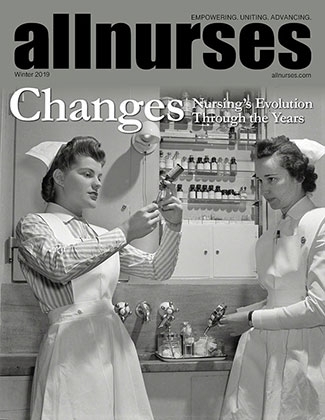 You are reading page 3 of How would Medicare for all affect nursing?. If you want to start from the beginning Go to First Page. I live very close to the Canadian border, and I have never seen or heard of this "Americans go to the front of the line". In fact, if you seek health care other than emergent, they want cash up front, period. We used to get transfers from north of the border where they would stabilize an MI, and then arrange for transport to the border, and be met by US medics to transport to acute care. My hubby sustained a fractured ankle in a softball game, and I drove him home for an Xray and walking boot. If people are so suspicious of the government, then why don't we privatize the military? Or the fire department? Or FEMA? Or the CDC? Or the national parks? Or ICE and CBP? I should have probably clarified that when I lived in Korea and Spain I was a military family member so only had Tricare which covered on-base care as well as off-base care. However, Tricare was funded by the US government. Not sure. I didn't realize private insurers had such a bad track record to deny claims. The one HSA I was offered through an employer looked like a giant ripoff. Only certain things were covered, and any unused money at the end of the year was forfeit. Not sure how Medicare should work. Just know there's a lot of waste and fraud that needs to be cleaned up. I think you maybe reversed your pounds to dollars calculator. The current exchange rate is $1.31 USD to 1 GBP. So 34,000 pounds would work out to $44,500. It's for sure less than nurses make in many areas, but around what some nurses make in other parts of the country. 1. The majority of bankruptcies in the US are due to healthcare bills, and about 75% of those bank bankruptcies are people who were "insured." 2. About 30% of all healthcare dollars spent in the US are spent on employees hired by providers to argue with employees hired by insurance over denials, coverage, and payments. 3. Government should be the single payer, but providers should remain private, and regulation should be a joint effort. 4. We are drowning in clutter and complexity. 5. Those profiteering form our system spend heavily to promote the arrogant notion that we are superior to the rest of the world and we have nothing to learn from them. 6. The US is spending about 18 % of our GDP while lagging countries who spend a third of what we do in broad measures like life expectancy (we're number 31 on the list) and infant mortality. The next most expensive country is Switzerland at about 12% of GDP. 7. Most countries that get better health for less money spend more than we do on social services and solve problems before they become medical problems. They promote health instead of enabling a few extremely wealthy people to profit from illness. 8. No matter how we do this, those who pay will always pay for themselves and everyone who doesn't pay. And to answer the original question, could nurses get paid less under some form of Medicare for All? Yes. It's a sacrifice I would make for the sake of honor. Those enriching themselves at the cost of human lives here would make billions less, and many would be out of a job. 42 days. If you can see one at all. Another major failing of the US system is that the ER is the only place forced to provide treatment without upfront payment. We find the cancer, then refer uninsured or under-insured patients to an outpatient oncologist who requires an upfront payment they can't afford. They flounder in in the outpatient world until they are close enough to dying to justify admitting them through the ER. OUxPhys has 4 years experience as a BSN, RN and works as a cardiac stepdown/progressive care. I read somewhere that they wanted to do away with private healthcare so maybe it wasnt accurate info, I dont know. I dont mean we dont know how Medicare works per se but how it will work once that is all we have (if no more private). And of course i know we have other gov agencies but they are not always ran well/efficiently, too much waste, IMO. Also, if we end up with Federal Gov ran insurance, and because fed law trumps state law, that means the those facilities could impose whatever ratios they want. For instance, the California VA does not have the state imposed ratios that other hospitals have. I asked in the CA forum if the VA abides by the staffing ratio there and they said they did. As for getting rid of private care entirely yes, there are candidates who said they would eliminate private care entirely (Sanders, Booker, Harris) but Harris eventually walked back her comments. DARLA766 has 8 years experience as a BSN, RN and works as a Transplant RN Case Mgr. Medicare already exists and covers 60 million people, so I'm not really buying that we have no idea how it would actually work. As for whether a publically run agency can do a good job at providing medical coverage, medicare already controls healthcare cost inflation far better than private insurers, and all the existing quality measures, even those utilized by private insurers, come from public agencies. Taxes would replace what we currently pay, with an overall reduction in costs. The typical employer-provided family insurance plan is $19,000 per year, with the employee paying about $5,000 of that. Since employers would no longer be allowed to skirt this responsibility, the per-plan cost would go down, and most likely the amount that was previously the employer's contribution would become an employer tax, and same with the employee's contribution. So while your $5,000 annual cost would now be paid through taxes rather than payroll deductions, the amount you pay would go down by at least 6%. Currently, much of the middle class pays far more than their fair share for healthcare coverage, removing that unfair burden is more likely to help than harm the middle class. I'm not sure where you're getting that "it will end private care", has current medicare somehow ended private care? Bernie medicare for all plan ends all private care. Hematocrit13 works as a Nurse. The question I have, is that Medicare is not free. It's pretty bare bones on its own and supplemental is all but mandatory. I admit that I don't understand everything about Medicare, but still. Mini2544 has 1 years experience. You've got the conversion wrong. The pound is worth more than the dollar. 34,000 pounds is worth 44k in the US. Furthermore, the UK nurses do not have the exhorbitant medical and University costs as their American counterparts. They also have far more in paid leave as well.